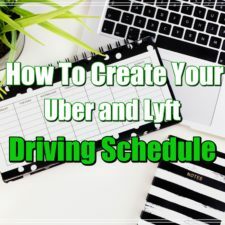 There are many ways to maximize your Uber and Lyft profits and one of the most important is through your tax deductions. When it comes to rideshare taxes things can get a little complicated. Fully understanding what expenses you can deduct can save you thousands. 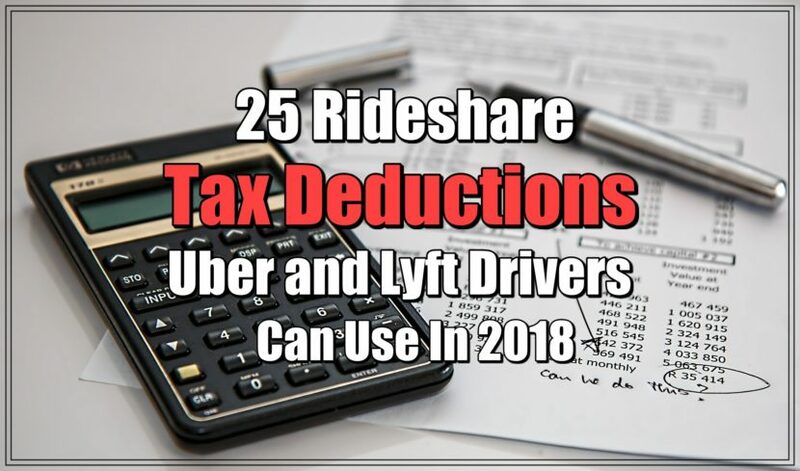 I created this list of 25 rideshare tax deductions for Uber and Lyft drivers so you can make the most of your deductions and save as much money as possible. Before we get into the specific tax deductions, lets begin with what you need to know about your taxes and how to file them. Unlike the traditional workforce, Uber and Lyft drivers file their taxes as self-employment income and will receive 1099s tax forms from Uber and Lyft. Rideshare drivers will pay their taxes via 1099-K for their driving services and 1099-Misc for other payments such as referral fees, incentives bonuses, etc. On the Uber and Lyft website you will be provided with up to three forms. Under Tax Information, you will find your 1099-K, 1099-Misc, and a yearly summary. A 1099-K will be provided if you earned at least $20,000 in gross payments and provided at least 200 trips. 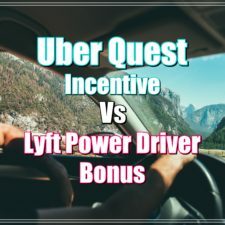 If you do not meet both of these criteria, you will not receive a 1099-K.
A 1099-Misc will be provided if you received at least $600 in non-rider payments such as referrals and on-trip promotions/incentives. Yearly summaries will be given to all Uber drivers. Here is an example of mine from 2017. Online Miles refer not to just your on-trip miles but to all the miles you drove while having your Uber application online. For the majority of drivers that own their vehicle your rideshare mileage will amount to your largest deduction. Gross trip earnings will match line 1a on your 1099-K.
Total Additional Earnings will match line 7 on you 1099-Misc. Expenses, fees, and taxes are important information on your yearly summary. Since you must report the exact number your receive for your gross trip earnings (1099-K) in your taxes, you must later on remember to deduct your expenses, fees, and taxes as commissions/fees. Many individuals forget to deduct these when completing their taxes (See Deduction #9). A 1099-K will be provided given you earned at least $600 in gross ride receipts from passengers in the past year. 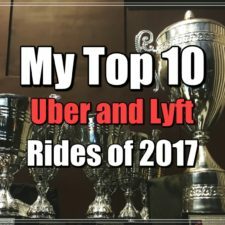 Yearly summaries will be given to all Lyft Drivers. Here is an example of mine from 2017. Your in ride miles and out of ride miles will need to be combined and that will give you your total mileage eligible for deductions. Gross trip payments will match line 1a on your 1099-K.
Total non-ride payments will match line 7 on you 1099-Misc. Lyft commissions mimic Uber's expenses, taxes, and fees section. Make sure to deduct these as commissions in your taxes as well. (See Deduction #9). When completing your taxes, you must choose to use your standard mileage deduction or your actual expenses deductions. You cannot use both categories for your tax deductions. Your business expenses will be able to be deducted regardless of your choice from the other two categories. Now, lets get into the 25 rideshare tax deductions for Uber and Lyft drivers. For every mile driven for rideshare purposes equals a deduction of 53.5 cents. That means if you drove 10,000 miles you can deduct $5,350 from your taxes! You can only use this deduction if you own or lease your vehicle. What miles count as deductible miles? 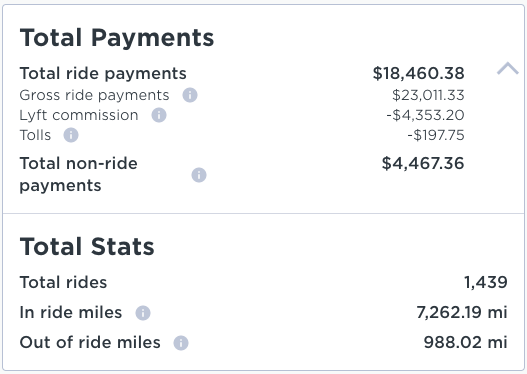 Any time you rideshare your miles are deductible. This includes all miles while your Uber or Lyft applications are online. You can deduct miles it takes to drive to your rideshare location you work in and miles you drive home after ridesharing. You can even deduct trips to the gas station or to gather supplies for ridesharing. I recommend using Quickbooks Self Employed to track your miles. Anytime you buy gas related to ridesharing it becomes a deductible expense. Did you replace your brakes or have to repair your car due to Uber and Lyft. Write it off! If you are leasing or renting your car, you can deduct a percentage of your payments. The percentage you pay correlates between your business use of your car vs the personal use of your car. You need car insurance to be a rideshare driver so make sure you deduct it. The write off amount is determined by the percentage of business use versus personal use. You can also choose to deduct all of your rideshare insurance instead. Did you replace your tires due to rideshare driving? Make sure to write them off. If you drive for Uber or Lyft, I guarantee you have had to get an oil change. Every year your car is losing value. If you own your car, you can deduct your annual car depreciation. There are several different ways to calculate your car depreciation. How you determine your car depreciation depends on how you use it between personal use and business use. This is where your yearly summaries for Lyft and Uber come into play. Find your Lyft commissions section and your Uber expenses, fees, and taxes section on your yearly summaries. These are what you will deduct as commissions/fees. 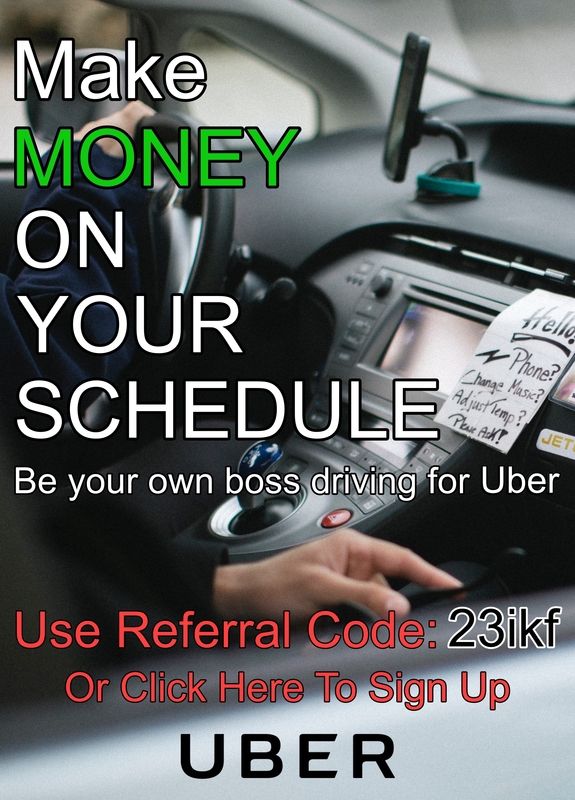 Any commission or fee Uber or Lyft took from your earnings is deductible. Not only is it smart to have a dashboard camera, but its also deductible. Deduction amounts relies on personal/business use percentage. 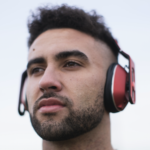 Did you buy any tailbone/support products for ridesharing? First off, they make driving long hours far more bearable. Second, you can deduct them. If you bought a cell phone just for rideshare purposes you can deduct the whole phone. If you are using a new phone that you use for personal and business purposes you can deduct a percentage of your cell phone that you use for business. Also, you can deduct a portion of your of cellular data plan as well. Did you buy AAA or other roadside assistance plans for ridesharing? If so you can deduct all costs of these plans from your taxes. If you bought it before find the percentage between personal and business use of the plans. Did you purchase any music subscription programs like Apple Music, Spotify Premium or Soundcloud Go for rideshare? If so deduct the cost. If its personal/business deduct the appropriate business use percentage. Unless you had one provided for you, you bought a phone mount. Deduct it. Did you buy additional cell phone chargers for yourself and your passengers? Deduct them! Candies, water, or any snacks/drinks are all deductible if bought for your rideshare passengers. Did you pay for any parking while driving for Uber and Lyft. Guess what deduct those parking fees! If you paid for tolls to get anywhere for ridesharing they are deductible. You can also deduct tolls that occurred during your rideshare trips. 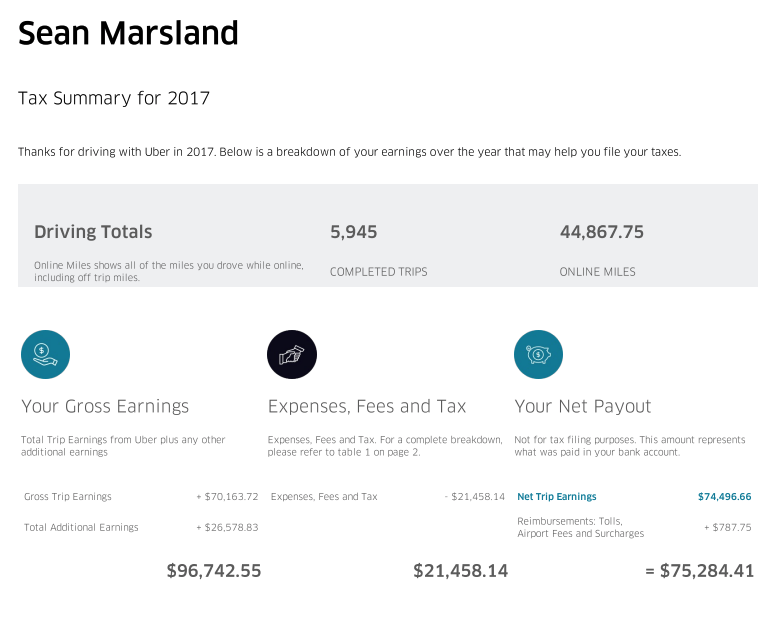 You can find tolls that you occurred during your rideshare trips under your Uber and Lyft yearly summaries. Did ridesharing up your amount of car washes? Write those extra car washes off. Did you buy a portable vacuum, lint rollers, or anything that you use to clean your car? Deduct it. Seat covers protect your car from unwanted stains. They also give your car a fresher look. Deduct these. Buying all weather car mats not only protects your car, but it also keeps it looking cleaner. Don't forget to deduct these mats. Did you buy febreeze, essential oils, or a diffuser to make your car smell wonderful for your passengers? Deduct those. Getting a massage a great way to loosen up your tense driving muscles and as long as your doctor prescribes them as medically necessary they are deductible. Go get yourself a tax deductible massage! There are several routes you can take to file your taxes. You can hire a CPA, go to retail tax professionals, or you can do your taxes yourself. If hire a CPA make sure they understand how to properly complete rideshare taxes. If you choose to do your taxes yourself, you should consider filing through TurboTax Self Employed. To maximize your tax deductions, I recommend purchasing Quickbooks Self-Employed + TurboTax Bundle. By doing this you get both Quickbooks Self Employed and TurboTax Self Employed. 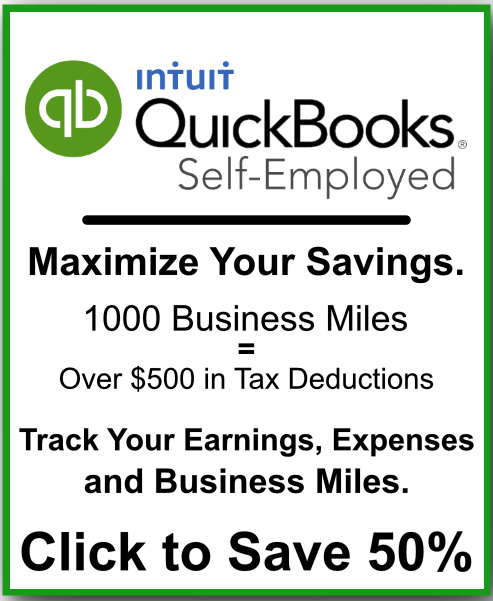 Quickbooks Self Employed tracks your mileage, expenses, and much more. With the bundle, you can integrate your mileage and expenses from Quickbooks straight into TurboTax. This simplifies your taxes and makes your taxes that much easier to complete. You can sign up here. If you have any questions or if I missed any deductions leave me a comment below! Disclaimer: I am not a tax professional. This information in the article is for informational purposes only. Consult your CPA or licensed tax professional for tax advice. Learn how to maximize your rideshare income and optimize your rideshare knowledge. 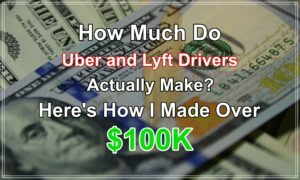 How Much Do Uber and Lyft Drivers Actually Make? 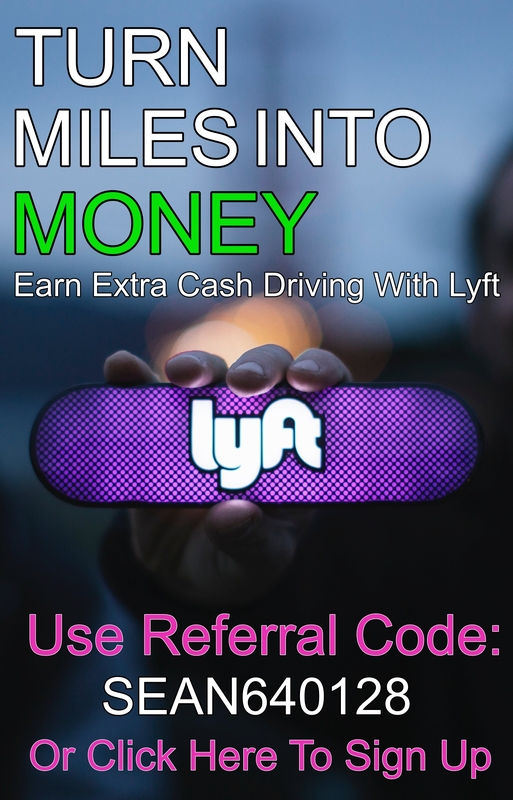 Access large Uber and Lyft referral bonuses by clicking the links below. Sean Marsland is the Six Figure Driver. Currently, he is located in San Jose, California. He loves entrepreneurial opportunities. Apart from rideshare driving and website developing, he is into personal fitness and outdoor activities. JOIN THE COMMUNITYLearn how to maximize your rideshare income and optimize your rideshare knowledge.